Join Nikki Estrada for this comprehensive beginner's workshop where you'll learn basic alignment in classic postures, yoga pose “do's” and “don'ts,” yogic breathing techniques, and much more. In this workshop, Nikki will guide you through three sequences that will help you work systematically toward six key asanas: warrior II, triangle pose, warrior I, pyramid pose, side angle pose, and wide-legged forward bend. She will also introduce posture basics for cobra, downward facing dog, and tree pose, and she'll break down common misalignments in pyramid and triangle. You will also get step-by-step instruction for half sun salutations, sun salute A, and sun salute B—as well as a yogic breathing tutorial, and savasana (final relaxation) tips. Explore what you learn on the mat. Visit these practices again and again—watch yourself improve over time, and most of all, have fun. And if you're a teacher, take what you learn into the classroom for all to enjoy. 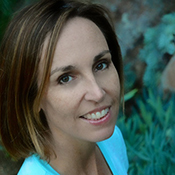 A YogaWorks Certified Teacher, Nikki is the Director of Trainer Development for YogaWorks in Northern California. She leads teacher trainings at the 200 and 300 hour levels, as well as classes, immersions and workshops..
A dedicated practitioner for more than two decades, Nikki's extensive studies include intensive practice with Sri Pattabhi Jois in India, as well as teacher trainings with Erich Schiffmann and Sarah Powers. Her current focus is Tantra, the practice of weaving spiritual experience into everyday life. Her teachers are Rod Stryker and Pandit Rajmani Tigunait of the Himalayan yoga tradition. Nikki's Vinyasa-based classes are a synthesis of her years of yogic study, Ayurveda and personal experience, with an emphasis on intelligent alignment, meditation and living life more joyfully. She resides in northern California with her husband and two daughters.